Soviet watches, CCCP Часы, kirovskies, K-43, Type-1, Тип-1, First state watch factory, First moscow watch factory, moscow watch factories, V. O. Pruss, Bodrov, Alexander Breytburt, Первый Государственный Часовой Завод - 1ГЧЗ, Artel Right Time, Trust of Local Industry, Тип-17 кирпич, Type-17 Brick, Vodolaz 191-ChS. of an industry that would rival the Swiss. 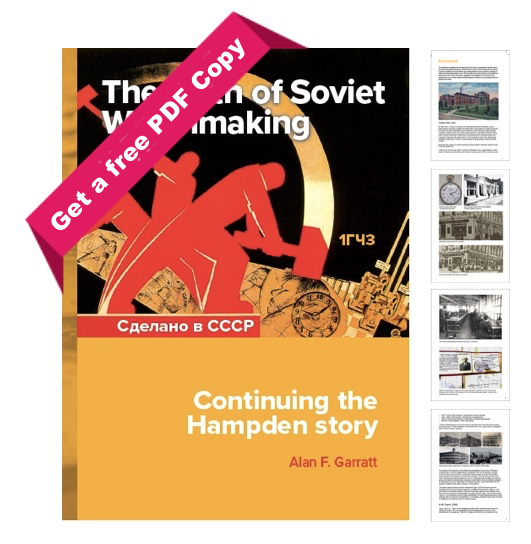 Twenty three former Dueber-Hampden watchmakers, engravers and various other technicians, who lost their jobs when the company went bust, were re-hired, on a years contract, to help train the Russian workers in the art of watchmaking. The party, including Sue Killen the only female watchmaker, left Canton on the 25th of February 1930 and spent several days in New York before setting sail aboard the RMS Aquitania on March 1st. The 8 day sea voyage was reportedly rough and ended in Cherbourg. The party reached Moscow on the 16th of March via Berlin and Warsaw. A band and a large crowd greeted them before they were taken to their allotted accommodation throughout the city. Любой, кто заинтересован в бесплатной копии в формате PDF, должен связаться с автором.